Started as Director of Music at St. Mark's on July 1, 2014. Served as Director of Liturgy & Music at St. Rose of Lima Parish, Gaithersburg, MD, from 2006 to 2014. Master of Liturgical Music, 2005, from the Benjamin T. Rome School of Music, The Catholic University of America, Washington, DC. Bachelor of Music Education, with Performance equivalent in Voice, 1980, from West Virginia Wesleyan College, Buckhannon, WV. Taught music K-12, at various public, private and parochial schools, most recently at St. Mark the Evangelist School, 2003 to 2006. 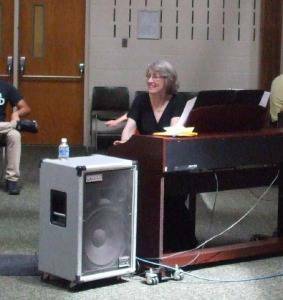 Taught voice and piano through private instruction. Married, with three children, two grandchildren, and three cats.